When is comes to settling SBA debt, borrowers often panic after they default, and attempt to rush through the OIC process. 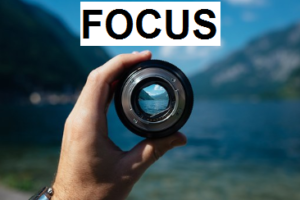 Just yesterday, my client told the bank (without checking with me first) that he would send the OIC (SBA Form 1150) form to them with a days notice. I don’t have any of his financials yet, so how can we draft an offer!? Folks, this is not the time to rush through the process. This is the time to be meticulous. Cross every t, dot every i. With that in mind, here is my list of things you want to do, and things you should avoid doing. Any settlement discussion is predicated upon good faith and full disclosure. And don’t just take it from me. Look at page 2 of SBA Form 1150. If it’s too hard to see in the screenshot, you can look at elements 2 and 3 here. 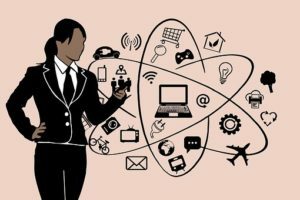 It may be tempting to leave off your retirement account, kids college funds, or that investment property that has tons of equity in it. The problem with leaving stuff off is that if the bank finds out, it’s going to hurt your chances o settling. But how would the bank know if you left asset off your PFS? A few ways, actually. The easiest way for them to check is to review past Personal Financial Statements that you submitted. They are always required when you apply for a loan, and in many cases, an updated PFS is required on an annual basis. If the bank obtains a judgement against you after you default, they may send you an information subpoena. The Information Subpoena is a legal document signed by the Court Clerk that orders the Debtor or others to answer questions about where the Debtor’s assets are located. If you answer untruthfully or don’t respond, it could result in an arrest. Public record searches can also reveal real estate that is in your name. When I was a workout officer, I’d check the local county clerks site if I thought a borrower was holding out. Finding a property with equity could mean paying off the loan in full – not settlement required. I’ve preached this in about 9 different articles, but it’s important. So I’ll mention it again. Treat the OIC with the same level of concern that you treated the loan application. I’ve had too many people come to me AFTER their first OIC was rejected, and show me a car wreck of an OIC package. Missing information. Hastily written offer. Long sob stories that have no bearing on the decision. Settlement offers that are missing information are likely to be rejected or kicked back to you. If it technically has all the right info, but just poorly executed or hard to follow, it’ll be rejected and you may have no idea why. Whenever I assemble an OIC package for the client, I always have a checklist. And I always stick to the facts. I’ll put a line or two about a sob story if my client absolutely insists on it, but the main narrative should always focus on the numbers. WHY you don’t necessarily have the money doesn’t really matter. They key is to outline what you do have, it’s not sufficient to pay in full, and why you can’t raise more. This is a particular touchy subject for me. The borrowers who casually make promises to their bank, then break them, also tend to do that to me. “I’ll get you that paperwork tomorrow” they say. Then a week later, I’m following up, reminding them that we told the bank we’d have it to them already. “I should be able to pay you next week” they tell me. A week later, no payment. They have been struggling to keep their head above water for so long, they don’t think twice about telling someone what they want to hear in order. If it buys them a few more days, they’ll lie and worry about the consequences later. 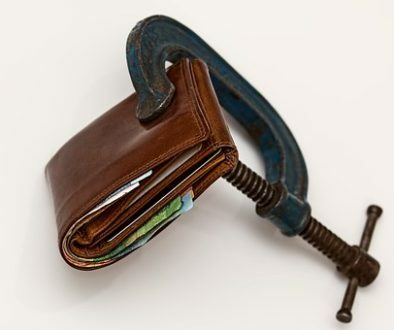 The borrower simply doesn’t understand the concept of under-promising and over-delivering. If you think you can get it done by Monday, promise it by Thursday. That way when you deliver on Wednesday, it’s actually early! 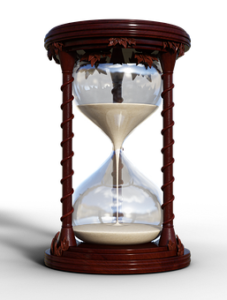 From the time you submit your OIC package to the time it’s done, you can expect it to take 4 to 8 months. That’s what I tell all my clients. Unless there is something majorly awry, you are best served by being patient. There is a process, and it always goes better if you let the process play out. I reserve going to the SBA for very specific circumstances. The bank won’t respond. Or they are blatantly wrong about the OIC protocols. I’m not saying you should do nothing. Stay in regular contact and be responsive. But when the bank says check back in two weeks, don’t make a federal case out of it. In theory, any OIC can be reviewed in about 10 minutes. In reality, you are one of many files on a SBA workout officers desk, and reviewing OICs is only one part of their job. So take a deep breath. It’s gonna take a while. Imagine trying to play basketball if you didn’t know that putting the ball through the basket is worth 2 points. Or if you didn’t know which way to run with the football? It’s hard to play the game if you don’t know the rules. 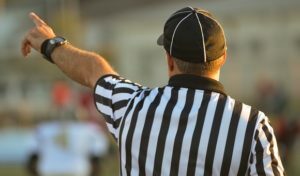 When it comes to pursuing the SBA Offer In Compromise, just like sports, you really need to understand the rules of the game if you hope to have any success. A few times a year, I get calls from borrowers who used a local attorney with no SBA experience to pursue an OIC. It usually takes about 60 seconds for me to understand what went wrong. Sometimes, they asked for a payment plan, but wanted the collateral released immediately (won’t happen). Other times, they are asking for 20 year repayment terms (won’t happen). And my favorite is when they want to negotiate a settlement BEFORE the business is closed (definitely won’t happen). When you renovated your kitchen, did you hire a chef? Of course not. Well, that’s what you are doing when you hire someone (attorney or not) who has no experience with the OIC process. When you renovated your bathroom, did you read articles on the internet to become proficient. Again, probably not. Of course, you realize that no matter how much reading you do, it’s impossible to become adept at anything on your first try. While a home renovation is hard, at least there is some room for error there. 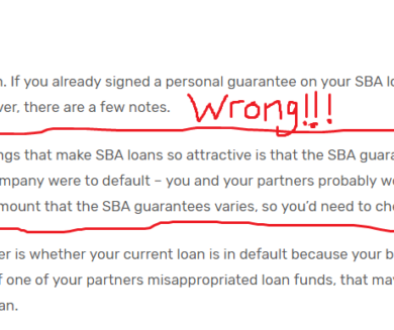 If you screw up your one and only chance to settle your SBA loan? It could cost you hundreds of thousands. 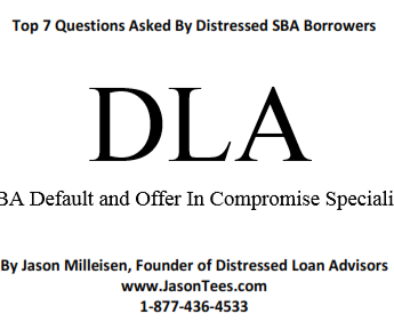 The SBA Offer-In-Compromise is required when a borrower or guarantor is seeking to have their obligation released for less than the full balance after a business has ceased operations. Release of a lien on collateral following a personal bankruptcy discharge. A repayment plan (such as a deferment or modification) that calls for payment of the debt in full. If you have a lender who doesn’t understand when an OIC is required, they could be sending you on an unnecessary goose chase. Expect the unexpected. The bank or SBA loses the file. Your workout guy hassles you over minor things. The appraisal comes in at more than you expected. The SBA rejects your offer for a reason you don’t understand. I never know what it’s going to be, but it’s always something. And that’s usually when I earn my money. Every once in a while, I have an OIC that gets approved without a problem. In the case, the headache is the customer asking for a discount on my fee because it “was not that hard” after all! In other words, there is less whining when things go wrong. Go figure! Any OIC that goes to the SBA for approval is supposed to by accompanied by a “thumbs up” from the bank. 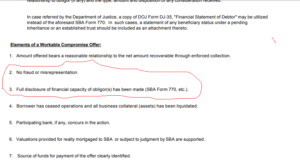 In other words, the SBA only wants to look at an offer if they originating bank agrees with the terms. If you make an offer to a bank, and they say no, don’t expect the SBA to step in. If you go to the SBA hoping they will go to bat for you, don’t hold your breath. They rely on the bank to vet offers. The SBA actually PAYS banks to service SBA loans. If a bank turns down your OIC, your best bet is to continue to work with them until you find mutually agreeable terms. Telling the bank that you lost every penny you had is not a settlement offer. 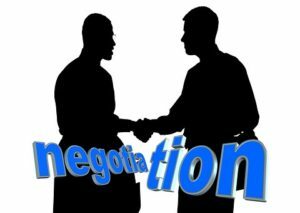 If you have nothing to offer, it’s not really a negotiation. If you pledged your home as collateral and it has $100,000 in equity in it, offering $5000 is a waste of everyone’s time. 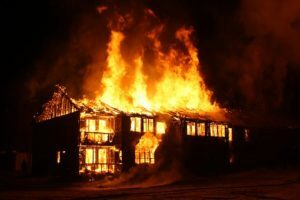 While I’m not going to get into the nitty gritty details (go here for that), just keep in mind that your settlement offer should bear a reasonable relationship to the amount recoverable through enforced collection. In other words, if it’s clear that the bank could collect more by suing you, it’s going to be rejected.